Click this image to hear each candidates' closing statement. What changes do you think the county needs to make to be more efficient? What in your opinion is expenditure for contingent liability and how would you propose to provide for that? As the County Judge, you're the chief budget officer. What qualifications do you have to hold that office (please be specific on the qualifications)? If elected County Judge, would you consider also being the director for emergency management for Polk County? Can you define and describe the role for that position? Since you were a member of the board of the Polk County Appraisal District during a time that an additional 20% increase in property value was implemented on all lake front properties, what steps did you take to prevent that sudden increase, and did you vote for or against the appraisal district operating budget increases? In your capacity with the ability to recommend appointees to the PCAD (the board of directors), what traits do you look for in a potential appointee, and do you monitor the appointee's voting record? Do you support the past increases in the PCAD operating budget? Would you let your personal interests or views concerning departmental, personnel decisions affect your decision concerning the budget process? If the property values decrease, and the rate remains the same, what programs or services would you first adjust? YES or NO. If the appraised value of the county property increases, and the tax rate remains the same, do you consider that a tax increase? Do you think it is the responsibility of the County Judge to keep the citizens of Polk County informed on the progress of Highway 59 expansion, and concerning property acquisitions along the road, do you think it is a positive thing for our county? The lake area is important to the county for economic activity and tax base. What programs have been instituted, or will you instititute that will help get some sub-standard roads and junk lots around the lake re-paved, improved, or cleaned up? Voters voted two times not to build the judicial center. Under what situation would you circumvent the will of the people and build it anyway? Over 60 waterfront property owners gathered to discuss their concerns that they were being unfairly targeted by the Appraisal District in the evaluation of their property. 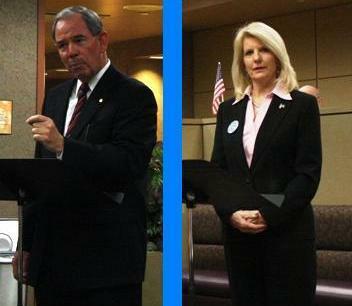 As the top county official in Polk County, how would you advise citizens to address their issues? What do you think about term limits for county officials, and why? What are your core values that led to your decision to join the Republican Party? Click this image to hear opening statements.